New experiences from ship to shore - NCL is an innovator in cruising. Find the best offers for cruises with Norwegian Cruise Line! The award-winning Norwegian Cruise Line has been making cruise dreams a reality since it first set sail in 1966. Setting itself apart with its 'Freestyle Cruising' experience, Norwegian Cruise Line provides guests the freedom of flexible dining and a diverse range of accommodation options, from classic Interior and Oceanview staterooms to single studios, spacious family Suites and the exclusive indulgence of The Haven. Let Norwegian Cruise Line blow your mind with exceptional onboard entertainment, including live music, hilarious comedy shows, and award-winning Broadway performances. Whether you prefer to relax and unwind poolside, chill out the world's only at-sea Ice Bar, walk The Plank or dine at the world's first at-sea oceanfront promenade, The Waterfront, the possibilities are endless. Treat yourself to a cruise vacation with Norwegian Cruise Line and explore exclusive destinations like Harvest Caye or Great Stirrup Cay onboard Norwegian Breakaway, Norwegian Epic or Norwegian Getaway. Explore top cruise destinations in Alaska, the Bahamas, Cuba and Panama Canal, or discover the Aloha Spirit and ultimate Hawaii cruising experience onboard the Pride of America – the only cruise ship that sails the Islands of Hawaii year-round, round-trip from Honolulu. The Norwegian Breakaway's modern and stylish ambiance marks the beginning of a dream cruise vacation. Relax, pamper yourself and shop until you drop on board the Norwegian Breakaway. The newly-refurbished Norwegian Dawn embarks on stunning voyages to Scandinavia, Canada and New England and the Caribbean. Set sail on an unforgettable journey in this spacious, stylish ship. Enjoy top entertainment, family-friendly activities, and international cuisine with the Norwegian Jade. Explore top cruise destinations with a vacation on this comfortable, casual ship. The Norwegian Jewel promises to provide you with a phenomenal cruise vacation. Choose from a variety of exceptional specialty restaurants, incredible live entertainment and a wide range of indulgent wellness treatments. Enjoy a world of possibilities onboard the Norwegian Pearl. From decadent dining to original entertainment, sports to wellness, the Norwegian Pearl has it all. The Norwegian Sun sails to the hottest cruise destinations in North and South America, including two Panama Canal repositioning cruises per year. Sail to Alaska, the Caribbean and more in a casual, family-friendly environment. Sister ship to the Norwegian Pearl, the Norwegian Gem offers comfortable, casual voyages to Canada, the Caribbean and more. Fine dining options ranging from classic Italian to Asian fusion set this ship apart from her peers. Enjoy world-class entertainment, a kid-friendly waterpark, and authentic international cuisine on the Norwegian Getaway. The ship embarks on family-friendly adventures to Europe and the Caribbean year-round. The Norwegian Spirit is a casual, welcoming ship that is perfect for a relaxing voyage to the Caribbean or sunny Mediterranean. Enjoy quality entertainment, flexible dining options and an onboard casino during your cruise. The Norwegian Sky brings you a world of choices, with over ten dining options, complimentary open bar, a fabulous wellness center and plenty of entertainment to keep the whole family enthralled. Norwegian Cruise Line's Pride of America is the only cruise ship to sail exclusively around the Hawaiian Islands. Enjoy an authentic Hawaiian experience on this stunning, unique ship. The Norwegian Star offers flexible, freestyle cruising to the top cruise destinations worldwide. With special staterooms for solo travelers, it is also a great ship for singles. The Norwegian Escape is part of Norwegian Cruise Line’s Breakaway Class and offers revolutionary facilities, innovative amenities and fun activities that guarantee an exciting, inspiring cruise vacation. The latest Norwegian Cruise Line ship, the Norwegian Bliss sails scenic routes in popular destinations in Alaska and the Caribbean. With special cabin classes for solo travelers, the ship is a great choice for singles, as well as couples and families with children. Scheduled to launch in 2019, the Norwegian Encore is the newest and largest ship in the Norwegian Cruise Line fleet. With an expanded "ship within a ship" Haven area, anytime dining, and more stateroom options than ever before, Norwegian Encore is truly redefining "freestyle cruising." After sailing around China for two years, the Norwegian Joy will undergo a massive refurbishment before moving to the U.S. West Coast in spring 2019. This high-tech, modern ship will sail to Alaska, the Mexican Riviera, and the Panama Canal. Bermudian owned company Norwegian Cruise Line is one of the leading global cruise providers and has its headquarters in Florida, United States. Norwegian Cruise Line is often cited as NCL and is one of the world’s favorite cruise lines, with cruise holidays to thousands of must-see destinations including Bahamas, Hawaii, the Caribbean, and Mediterranean. With a rich vein of historical success in breaking the boundaries of traditional cruising, NCL is continually introducing brand new ships to its fleet, as well as launching new itineraries. Today, it has a combined fleet of 25 ships allowing you to discover your very own personal expedition. Cruising NCL means fun and laid-back experience with no enforced dress codes and fixed dining. Today, NCL invites their guests to enjoy “freestyle” cruising concept – just leave your jacket and tie at home if you wish! As the innovator in cruise travel, Norwegian Cruise Line understands that flexibility at sea is essential to guests’ holiday experience. Once aboard you will have a unique culinary experience with live cooking stations, Asian Fusion dining venues, and an American-style steakhouse. During your expertly crafted voyage, there is plenty to do, including Broadway shows like “Burn the Floor” and “Rock of Ages”. When it comes to live music, Norwegian Cruise Line’s options are notably varied. Enjoy the soulful sounds of jazz at “Fat Cats Jazz & Blues Club”, experience a vibrant rock-and-roll scene at “The Cavern Club” or get into the pure, moody magic at “Howl at the Moon”. Design your ideal cruise holiday on your schedule – when you want, where you want and with whom you want! Cruisers sail to many different destinations that most will ever dream of and NCL is ready to show you the best bits of the world. Take a stylish and adventurous cruise to down under and make long-lasting memories in the Bahamas and Bermuda. Sometimes you just need a quick escape – explore stunning icy fjords with one of the Alaska cruises, or soak up some sun on the Hawaii cruise. Norwegian Cruise Line has received many awards for its ships, including “World’s Leading Large Ship Cruise Line” in 2016, the fifth time in a row! You will feel like at home on the 19-deck mega-ship Norwegian Epic. Indulge in elegance and luxury. 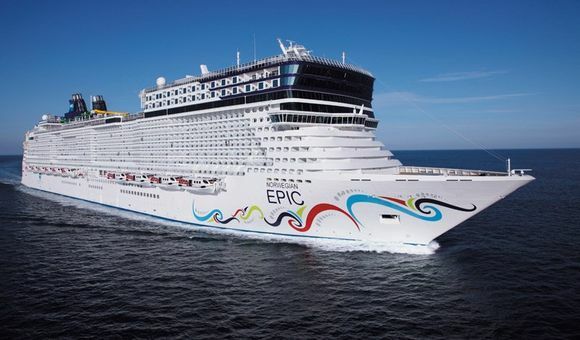 Norwegian Epic has a vast range of accommodation options. Modern and spacious cabins will please even the pickiest traveler. Norwegian Sky is one of NCL’s most popular ships and facilitates a luxurious and refined cruising experience. Norwegian Sky makes a great choice of onboard activities which appeal to a variety of age groups. Water parks, dancing classes, wine tasting evenings, all kind of activities run throughout the day. Norwegian Jewel – a ship that was created to delight and entertain. Explore award-winning restaurants and casinos while cruising from port to port. Would you love to explore wildlife treasures of Alaska? NCL offers you 9-day cruise from Seattle to New York with majestic Norwegian Jewel. Discover best cruise deals with Norwegian Cruise Line and book your ideal cruise holiday today!